Jenna Benn after her first round of chemo. 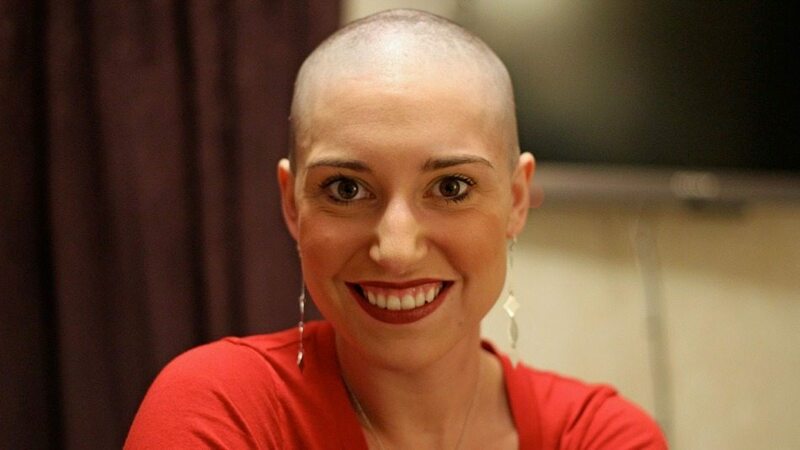 Jenna Benn is a survivor of a rare cancer type known as gray zone lymphoma, which she was diagnosed with at age 29. In the winter of 2010 she was forced to ask herself the above questions along with thousands of others young adults facing cancer. In fact 70,000 young adults are told that they have cancer each year. And just like Jenna, all of them have to put their lives, which are just starting to get underway, on hold. Many have just settled into a steady job, moved into that “great apartment”, and have built a solid group of friends. So when facing cancer, young adults have myriad of issues that are unique to them, and not any other age group. Such as just losing the sense of independence that they have just developed. Or concerns over how their physical appearance, fertility, and relationships with friends and lovers are all changing at once. One top of that are the endless finical concerns including continuing education, paying insurance and medical bills and trying to stay employed during treatment. Jenna Benn’s amazing cancer story has her navigate these major issues and end her journey with a network of support and the discovery of a partner she plans to share her life with. Read the full article here! Jenna Benn under going chemo. 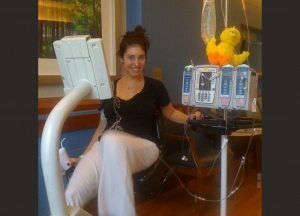 We at the Ulman Cancer Fund for Young Adults provide the support and resources to help those like Jenna also complete their cancer journey with the support they need. Either through weekly support groups, scholarships, training programs like our Cancer to 5k, ChemoCare bags, or just our resource guide and informational directory. And you can help too by volunteering with us in numerous ways. Whether you spend time cleaning a cancer patients home in our Helping Others Fight program, acting as a volunteer coach in Cancer to 5k, joining Team Fight or the Cancer to 4k, you can help make a difference in the lives of those impacted by this disease.